CM Magazine: Money: Make It, Spend It, Save It. Money: Make It, Spend It, Save It. J.E. Bogart. Illustrated by Teco Guerreiro. 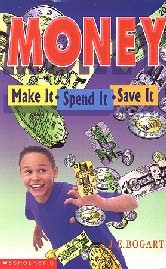 Money-making projects for children-Juvenile literature. Have you ever heard of a bull market? No, it's not beef for sale! The name refers to a market that's experiencing a lot of growth. Bullish investors are optimistic types, who trade in the hope that stock prices will continue to rise. A bear market is one in which stock prices are falling. Bearish types make their trades believing that the market is in a downturn. Though having money won't guarantee happiness, understanding money and using it wisely can help kids to achieve their goals. This informative book, Canadian in content and chock-full of timely financial advice, is written in language that is easy for young people to comprehend. Even the more difficult concepts of investing and compound interest, for example, are explained in simple terms. The book is divided into five main chapters, each with a number of subheadings. Topics include the history of money, from the earliest known form of currency to today's "e-money," earning money (allowances, part-time jobs and money-making ideas), banking, investing and spending. Instructions for establishing a budget, writing cheques and using an ATM machine are just a few of the tips that will be helpful to kids along with information about credit card use, term deposits, GICs, stocks and bonds. Safety issues, such as never disclosing one's PIN and on-line shopping, are also discussed. Fairly large text, inkline drawings and several charts, quizzes and fact boxes keep the book "kid-friendly" and add to its appeal. An index and a list of related websites will further direct readers to the specific financial information they need. Helpful, informative and fun.